Whether you’d like to clear a small pathway, or you’d like to de-ice a large commercial property - Pro Landscaping is happy to help! We offer a wide range of winter maintenance services, including snow and ice removal. Pro Landscaping has licensed and certified experts in salting, shoveling, and snowblowing. We use safe and effective methods to ensure that snow and salt won’t damage your property, and our team places client satisfaction above all else. When it comes to winter maintenance and snow removal, Georgetown residents understand that outdoor maintenance teams need to be effective and reliable. Pro Landscaping is pleased to exceed these requirements, as we clear every property extremely thoroughly to prevent any further damage. No matter how harsh the weather, Pro Landscaping’s dedicated team of staff will clear your property of any ice or snow. 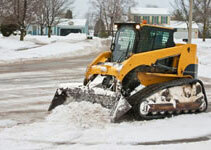 Our focus on client safety and satisfaction make us the best choice for Georgetown snow removal.